For as long as I’ve walked on this planet, space has worn humanity’s footprints – satellites, Voyager, the bits and pieces left behind on the Moon by the Apollo missions. Neil Armstrong taking that small step has always existed in grainy black and white footage and we’ve always been a space-faring species, even if we’ve not quite passed the garden gate. It’s always been this way, at least for my generation and the generations since. And so today it’s good that there are some many commemorations of Yuri Gagarin and his flight 50 years ago, a flight that lasted under two hours but which changed everything, opening up a whole new horizon as he became the first human being to go into space, the first to orbit the Earth. It was a massive achievement – I think it’s been overshadowed by the moon landings, and certainly I remember mutterings that the series Enterprise, with its opening montage of historic moments in spaceflight, had somehow managed to omit Gagarin. Oversight? Probably, but it just goes to show how easily we forget. Maybe that’s because it was a different world back then, two superpowers eyeing each other warily, everyone else seemingly stuck in the middle, nuclear spectres stalking history and secrets and fears spinning the globe. Everything’s changed now, and the space race now just feels like history, a bygone age of spies and empires, one of which is now dead, the other hanging on as everything changes around it. 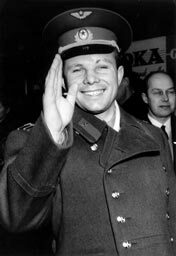 But I’m having a bit of a personal response to this particular anniversary – I hadn’t realised how young Gagarin was when he flew into orbit. 27 is nothing, heck, nowadays it’s almost still adolesence. And yet there he was, changing the world in his mid-twenties. Seven years later he’d be dead, killed in a plane crash at 34, the same age I am now. It’s stupid I know, but it makes me look at my accomplishments, or lack of them. 34 still seems young to me, but by that age some people had already changed the world. But that’s maudlin, and if you let it the idea of space exploration can do that to you, reminding you of your smallness and your fragility and your transitory nature. Instead I like to think of it was something liberating and empowering. Yes, the universe is big, but we can still look up and step out into it, sailing towards another destination, flinging peole out there and letting them poke around. So raise a glass to Yuri Gagarin, because 50 years ago he heralded the world in which we live. And look to the stars for they’re in reach, even when we tell ourselves they’re just too far away. This entry was posted in Astronomy, History, Space and tagged astronomy, history, russia, science, space, space exploration, via ljapp, yuri gagarin on April 12, 2011 by Matt.